One thing about Japanese automakers every American knows “for sure”: Their conquest of the U.S. market was orchestrated by a wily government that cunningly kept American brands out of its own. Yeah, you can make a case for that. But you can also make the case that with friends like their own government, Japan’s automakers need no enemies. Especially now that Japan’s bureaucrats seem hell-bent on cooking the goose that laid the golden egg, destroying within a generation their largest and most profitable industry. For starters, consider how Japan’s politicians managed to deny their manufacturers pole position in the world’s largest auto market. The Senkaku Islands are a barren group of bird rocks, nearly 1,200 miles from Tokyo but just 125 miles from Taipei, that no one has found a use for over thousands of years. While Japan is nominally in control, both China and Taiwan dispute its sovereignty. Still, the issue lay dormant for decades until 2012 when Shintaro Ishihara, Tokyo’s ultra-nationalist governor at the time, moved to buy the islands from their private owners. When Japan’s government responded by nationalizing them, anti-Japanese riots broke out across China. And no riot was complete until a Toyota had been torched. As Japan’s outraged media foamed on about the value of oil that might, just might, be under the seabed, no one mentioned the real prize: China’s auto market, by then the world’s largest. Japanese brands already lagged the Germans. But from 2012 through 2015 Japanese makers’ share of the Chinese market declined slightly to 16.6 percent as Europeans (notably Volkswagen) rose by 1.1 percent to 22.3 percent, with a rich German mix. GM and Ford meanwhile—those Detroit zombies risen from the grave—increased their Chinese market share from 11.8 to 12.5 percent. With GM still twice as big as Toyota and Ford closing fast on Japan’s Big Three, Detroit may soon surpass Japan in China. Adding to the humiliation, South Korea’s Hyundai/Kia has left Japanese makers in the dust. Japan’s failure to dominate the world’s largest auto market, literally in its own backyard, is a blunder of historic proportions, and the nation’s right-wing politicians deserve full blame. The Senkaku debacle marked the moment of Japan’s worst defeat since 1945, but it was decades in the making. By failing to do what they did so successfully with the U.S.—heal the wounds of war, gain trade access, and win consumer hearts and minds—Japan’s government has badly damaged the future prospects of its most important industry. So they blew it in China. But haven’t Japan’s leaders managed to stoutly defend the home market? 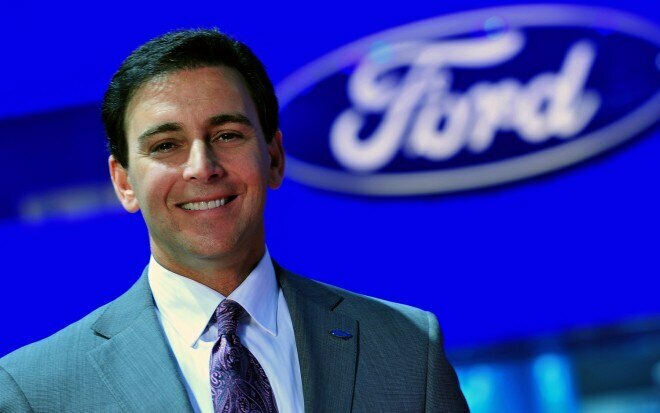 Earlier this year when CEO Mark Fields signed off on the notice that Ford Motor Company was pulling out of Japan because its market is “closed,” you can bet the Czar of Dearborn had a wry smile on his face. As former CEO of Mazda, Fields knows Japan’s market numbers better than anyone in Detroit. And those numbers tell a story like something out of World War I trench warfare: Everyone gets bloodied, but no one risks losing face by giving up an inch. Japan’s market is “closed” like a shallow grave in a profitless stalemate between Godzilla and the Seven Dwarves: Toyota with roughly a half share and seven other home teams scrabbling for the scraps. Inefficient distribution networks make the cost of sales staggering. All brands have hideously over-proliferated model lineups. And it’s a game of musical chairs; sales volume has dropped almost 13 percent over the past 10 years, in step with a rapidly aging and declining population. Meanwhile, the Germans have swooped in to cherry-pick the premium morsels from the pot. If all that isn’t enough, Japan’s government “helps” the home teams by mandating an artificial segment that foreigners won’t enter—for good reason. “Kei-cars,” mini-vehicles limited to 0.7-liter engines, are unique to Japan: pop cans on wheels that wouldn’t pass the crash test in most countries. Spawned by 1950s regulations meant to help farmers motorize, they are favored by generous tax breaks, lower insurance rates, and relaxed parking regulations (more on that later). Plus, in a high gas-tax regime they deliver great fuel economy. No wonder minis account for 40 percent of sales, all to Japanese makers, notably Suzuki and Daihatsu. This is hardly a gift to the automakers. 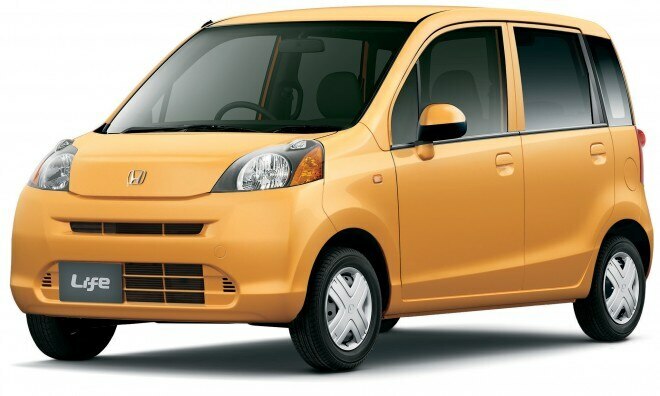 Sold through Japan’s high-cost sales networks, the average kei-car yields an even thinner margin than the barely profitable compacts Japanese brands sell. They require a separate product development stream, which is why Nissan and Mazda opt for badge-engineered product from Mitsubishi and Suzuki. 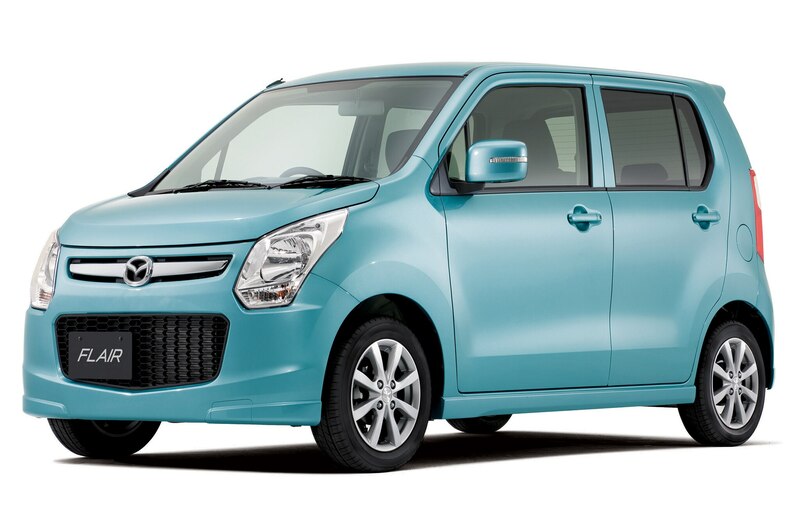 If instead of kei-cars the manufacturers could each sell an extra 100,000 global B-cars at home, it would at least give them a useful boost in scale. Worse is the signal this incentive to thrift sends to a nation desperately trying to revive consumer demand and reflate its stagnant economy. Living in tiny dwellings crammed with Gucci bags and big-screen TVs, Japanese have little room for new stuff, but many more could swing a ride to drive with pride if their government didn’t go out of its way to make car ownership such a dismal proposition. Buying a new car in Japan is a bureaucratic nightmare that starts with the 3 percent “vehicle acquisition tax” on top of an 8 percent sales tax. But you can’t take your new toy home until you have a registered parking space within 2 kilometers of home. If an apartment dweller, renting one in central Tokyo will run you up to 90,000 yen monthly (about $838 U.S.) or half that in the suburbs. With your parking-lord’s certificate in hand, you proceed to the local police, pay 2,100 yen (about $20) and hand-draw the location of your spot on a form. The cops then dispatch an official who measures your parking spot against the spec and woe is you if it’s a millimeter smaller! No wonder less than half the households in Japan’s largest and wealthiest city own a car. If you live in a smaller burg and buy a kei-car, though, guess what: no parking registration needed. If you’re still foolishly bent on owning a real car, each year you must pay vehicle tax under a complex formula, typically about 45,000 yen (about $419). Every second year you need a “sha-ken,” a fitness inspection that inevitably costs 100,000 yen (about $930) since they always find something to fix. Once on the road, the fun rolls on. Although fuel taxes, totaling about 65 yen per liter, are lower than Germany, expressway tolls are highway robbery: 24.6 yen per kilometer, which means $36.50 to go 100 miles. But here’s the best part: The speed limit is just 50 mph. Zoom-zoom! 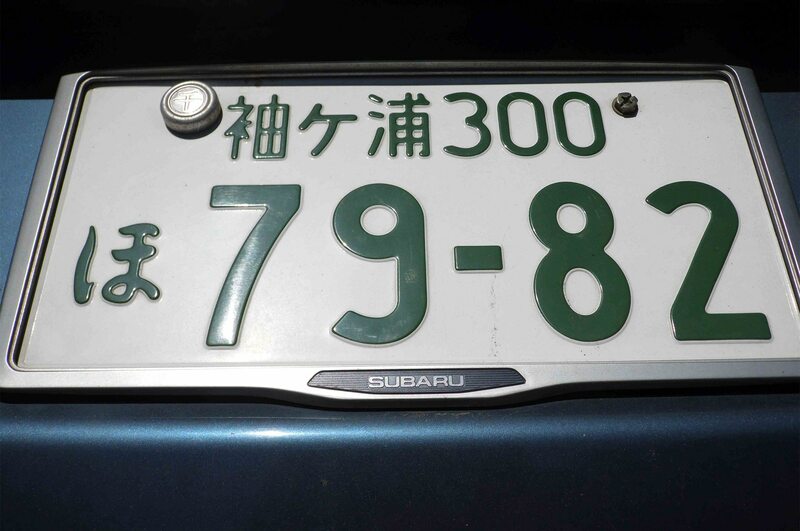 Missing no opportunity to dull your ride, Japan slaps world’s most boring license plates on its cars. Where colorful U.S. plates express home-state pride—Live Free or Die, baby!—our monochrome plates shout out the transport ministry office that issued them. Only two plates nationwide are considered cool: Shinagawa and Shonan. My “Sodegaura” plates brand me as a hick. Little wonder that, even more than American millennials, Japanese youth are taking a pass on driving, especially as they are expected to attend a month-long driver training course costing 300,000 yen, or about $2,800. With world’s best train system going everywhere, who needs the hassle? Even geezers are now hanging up the driving gloves. Since most Japanese commute by train, driving has always been a weekend hobby for men. But now that Japan enforces the world’s strictest blood-alcohol limits—absolute 0—people are too scared to drive after even a sip. Drinking in Japan is way more fun than driving. Guess which one now wins the weekend? What gets lost with all this? To sustain a world-leading car industry, a nation needs a vibrant automotive culture that captures the imagination of each successive generation, plus consumers continually willing to reward the home teams’ best efforts. Germany’s always had both in spades, and the U.S. seems to be getting its mojo back. Meanwhile, Japan persists in dulling down its automotive culture and pushing consumers to buy models no other market will touch. Within a generation that may well destroy the passion for cars and for quality that has driven Japan’s car industry over 50 years. Sure, the government got the ball rolling, but it wouldn’t have rolled far without the remarkable energy, diligence, and dreams of millions of Japanese engineers and line workers, people who are now retiring in droves. Who will replace them? With a national workforce set to shrink by 8 million over the next 15 years and an aversion to immigrants, Japan is going to have trouble staying at the forefront of the global industry no matter what. But even if robots take up the slack in the factory, automation can’t replace the incredible passion and genius that Japan’s baby boomers and their parents brought to the game. Japan’s younger generation just doesn’t have it. Having grown up in such a dismal automotive culture, who can blame them? The brands will survive, but likely as Japanese in name only. Tokyo and Nagoya may become the automotive answer to Delaware, with brass plates on hollow head offices. Still, maybe it’s not too late. Instead of stamping it out at every turn, here’s hoping that Japan’s government learns to cherish and cultivate its automotive culture with the same care it shows to kabuki and ikebana. John R. Harris is a Canadian freelance writer who has spent the past 30 years in Japan.